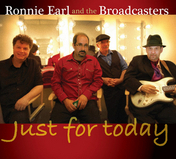 EDMONTON, AB – Stony Plain records announces an April 9 release date for Just for Today, the new CD from legendary guitarist Ronnie Earl & the Broadcasters, recorded live at The Regent Theatre, The Natick Center for the Arts and The Narrows Center for the Arts, venues all located in his home state of Massachusetts. Acknowledged as one of the best guitarists on the planet, Ronnie Earl celebrates the 25th year of the band with long-time Broadcasters’ members Lorne Entress – drums, Dave Limina – piano and Hammond B3 and Jim Mouradian – bass. Singer Diane Blue is a special guest vocalist, and Nicholas Tabarias joins in on guitar for two songs. Just for Today is Ronnie Earl’s seventh album for Stony Plain and follows his acclaimed 2010 release, Spread the Love, which drew universal praise for its power, soulfulness and spirituality, traits which have become the hallmarks of all his recordings. said j. Poet in his San Francisco Examiner review. “The pacing, segues and production are masterfully done, and the unbridled passion in his playing creates a joyous, uplifting vibe,” added Jeff Johnson in the Chicago Sun-Times. Born in Queens, New York, in 1953, Ronnie Earl’s journey to become one of the top guitar players in the world began quite late, since he didn’t pick up his first guitar until age 20. 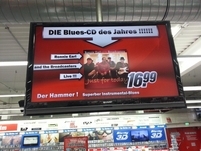 Inspired by Muddy Waters, T-Bone Walker, B.B. King, Freddie King, Otis Rush, Big Walter Horton and The Fabulous Thunderbirds, Ronnie quickly developed his six-string skills, playing with an intensity that continues to this day. He has played with such greats as Carlos Santana, Eric Clapton, Earl King, Stevie Ray Vaughan, and The Allman Brothers as well as several of the musicians that inspired him early on. From 1979 to 1988, Earl played with a number of groups before forming his own band, The Broadcasters, named after the first Fender Telecaster guitar called the Broadcaster. The current Broadcasters line-up have played together for over 13 years and continue to tour, playing their inspired sounds for grateful audiences everywhere, spreading Ronnie’s gospel of love and healing through music. "Rush Hour," "Blues for Celie,"